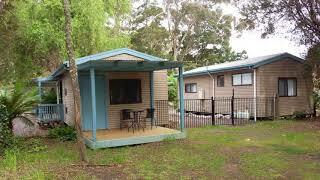 BIG4 Strahan Retreat Holiday Park offers a large selection of accommodation to suit all budgets in Strahan. The retreat caters for couples through to large group bookings. Covering 8 acres in total there are powered sites for motor homes and caravans plus cottages varying from Studio to four bedroom sleeping up to ten people. There are self contained park cabins that sleep four, five or six. Our deluxe Retreat Cabins offer real luxury. All come with en suite, cooking facilities and linen. Strahan Holiday Retreat is a beautiful location with a meandering platypus creek winding through the property. Molly’s Cafe is located on-site and caters for breakfast, lunch and dinner. There is an ATM, a bottle shop and free Wi-Fi. A safe swimming beach, boat ramp and jetty are a short two-minute walk away. Strahan is located on the edge of the Western Wilderness World Heritage area. You can take a Helicopter flight over the South West Wilderness, cruise the Gordon River, ride the West Coast Wilderness Railway to Queenstown or just take a leisurely stroll on the magnificent Ocean Beach while waiting for an amazing sunset. Sand boards, Bikes and Kayaks available for hire from the retreat reception.